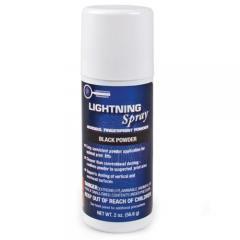 Quickly record latent prints with less mess and greater accuracy than ever before using Lightning Powder's new Black Powder Lightning Spray. Optimized for light colored surfaces, the specialized print powder clings to the slightest trace of residual oil or moisture left behind by suspects to deliver a clear print picture with impressive detail retention. With its aerosol spray deployment method, Lightning Powder has eliminated the need for brushes and canisters filled with loose powder and therefore removed the chance of unnecessary spills, messes or wasted product. The canister can be used on both vertical and horizontal surfaces without fear or streaky or runny prints. When it comes to high quality and dependable forensic equipment there is no brand more trusted by CSI professionals than Lightning Powder.